This property is part of a particularly distinctive group of double houses and is good example of the popular late 19th C and early 20th C house type known as the American Four Square and includes Craftsman stylistic details. While it was designed by a local architecture firm, it is very similar to popular plans known to have been promoted by local and national planbook purveyors during this era. It is located in Woodland Park Addition to Salmon Bay City, which was plated by Robert D. McFadden in February 1887 and was one of the earliest platted and developed residential areas in Fremont. This group of double houses was constructed in 1909-10 during a very intense period of historic residential development in the district and the city. The original building permit (#83280) indicates that the permit for construction of a “2 story frame residence” costing $4,800.00 was issued to Perle Pemberton – the owner and builder - on October 8, 1909. The firm of Bresemann & Durfee was listed as the architect. Perle Pemberton appears to be related (possibly a cousin) to Elmer, Adrien and Straud Pemberton – the proprietors of Pemberton Brothers, general contractors. Perle C. Pemberton (1876-1948) was born in Iowa and while listed in the 1910 Polk’s Seattle City Directory h was listed in the US Census in 1900, 1910 and 1920 as residing in Los Angeles (Los Nietos and Long Beach) with his family. He is consistently identified as a house painter. Adrien and Elmer Pemberton were born in Kansas in c.1877 and c.1879; Strand Pemberton was born in Missouri in c.1883; however they appear to have been brothers. They may have begun to work in Seattle c.1906. In 1910, Adrien, Elmer and Strand Pemberton appear to have all been residing in Seattle according to the US Census and were operating a successful construction and real estate development business with offices in the Central Building. Adrien was a building contractor and Elmer may have been a heating and ventilation installer: Strand appears to have initially worked as a carpenter. They appear to have possibly developed/resided at other clusters of residential properties/double houses, including properties at 6242 3rd NW and 6034 1st NW (1907); 4327 4th NW and 4208 5th NW and 4203 6th NW (1908); 4336-37 4th NW and 4226 Baker Ave. NW (1911); 6740- 6750 - 6758 11th NW (1913); 808 NW 64th, 602 NW 52nd St, 311 N.43rd St (1914); 4320 6th NW (1915-1916). A 1912 newspaper citation indicates that Elmer Pemberton designed a2-story house to be constructed for $4,000 for O.M. Rupp at 201 N. 46th St. (Seattle Daily Journal 12/19/12 p.4). A 1911 newspaper article included a picture of the home of Lenora Pemberton at Phinney Avenue and N.43rd St.; it appears to be a part of complex of buildings similar in design and site configuration to the subject property/complex. By 1920, Elmer and Strand Pemberton were listed in the US census as also residing in Los Angeles County (Inglewood) and both working in the heating and ventilating business. By 1920, Lenora Pemberton – relationship not known – appears to have been residing in San Francisco. The architects identified on the permits for the identical double-houses are Bresemann & Durfee [Emanuel J. Bresemann and Eugene Durfee], a partnership that appears to have occurred between 1908 and c.1913. Very little is known about Mr. Durfee. Emanuel Bresemann’s career is well documented in an essay available on Historylink.org (by Nancy Covert). Emanuel J. Bresemann (1881-1971) grew up in the Steilacoom area and learned the furniture-making trade from his pioneer father. He then went into architecture, and during his long career he designed, in addition to schools, more than 30 private homes and numerous commercial buildings. He initially took correspondence courses and trained with Tacoma architect Ambrose Russell before moving to San Francisco in 1905 where he attended Humboldt Evening School to study architecture. There he met Eugene Durfee and upon graduation they established a partnership. After settling in Seattle, the firm established offices in the Central Building, where Pemberton Bros. offices were also located. Among their successful built commissions were the Westlake Hotel (1910), the Washington Interior Finish Co. factory in Fremont (1910), the Ravenna Parkside and the Heather Arms Apartment buildings (1910) and St. John’s English Lutheran Church (Tacoma, 1910). They also established offices in Victoria and designed the First Congregational Church (1913). After the partnership dissolved Bresemann moved to Tacoma were he continued to practice until 1961, designing dozens of distinctive residences, numerous public school buildings and several commercial buildings. This is one of a set of four matching double- houses (duplexes) that were constructed/ developed together as a group in 1909-10. Located mid-block on the west side of Whitman Avenue N. with the front elevation oriented to the east. Two story, wood-frame, double-house (duplex) design. Distinctive example of American Four-Square house type with Craftsman details. Generally well preserved. Measures approx. 22’ x 44’ w/ concrete foundation and full basement level. Prototypical low-pitched Craftsman style hipped roof form with wide overhangs. Projecting full width hipped roof porch at façade. Hipped dormer with wide narrow multi-pane window at main elevation. Clad with original narrow horizontal cedar siding at first floor and upper section of second floor level. Cedar shingles at band below second floor windows and at dormer. Original double-hung wooden cottage windows w/multi-pane upper sash appear to remain in place. One square bay window at upper floor north elevation. Original entry doors at openings located at each end of the porch have been replaced. Highly distinctive square porch posts with ornate kneebrace brackets remain in place. Modern horizontal skirting at base. Porch guardrails and stair handrails are not original. Roof non-historic composition shingle. The character and condition of the interiors are not known. 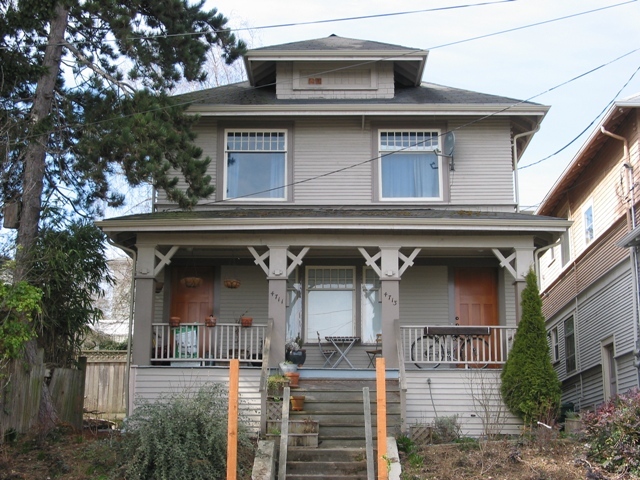 Architects file cards, Seattle Department of Neighborhood, Historic Preservation Program. Sanborn (Insurance) Map Company, Seattle, Washington, 1917.